No dinner is complete without a dessert! Drain 1 tin Koo cocktail canned fruit. Whip ideal milk until foamy and thickish. Add jelly mixture and whip well together. Use a deep bowl for this pudding. Set pudding and add the drained canned fruit and garnish with a flake chocolate. Add 2 cups (500ml) boil water to jellies and set aside to cool off. Add cool off jellies and mix well. In a square dish put whole tennis biscuits in it. Pour the jelly mixture over it. 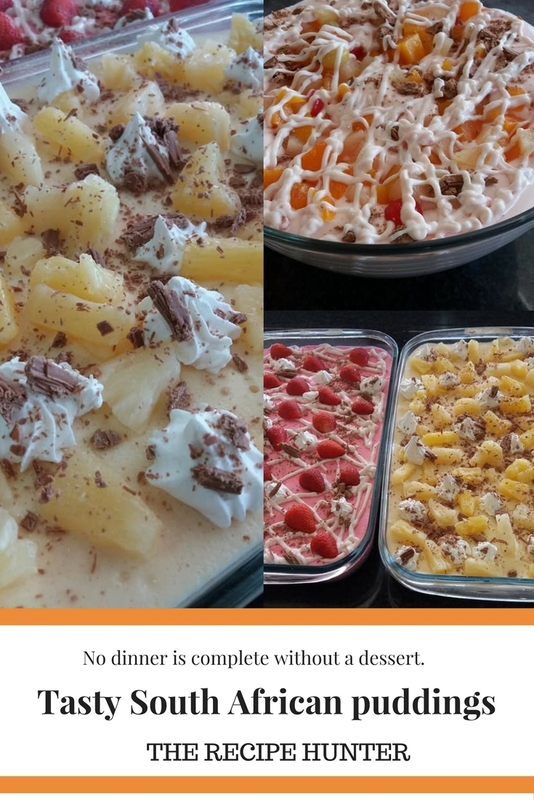 Add drained pineapple pieces over pineapple dessert, refrigerate until set. These recipes sound delicious, Esme. Lovely and light.